Georgetown University is a private research university in Washington, D.C. Founded in 1789, it is the oldest Catholic and Jesuit institution of higher education in the United States. Located in Washington's historic Georgetown neighborhood, the university's main campus is noted for Healy Hall, a National Historic Landmark. 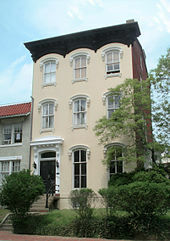 Georgetown's law school is located on Capitol Hill, and the university has auxiliary campuses in Italy, Turkey, and Qatar. Georgetown's founding by John Carroll, America's first Catholic bishop, realized efforts dating from the settlement of the province of Maryland in 1634 to establish a local Roman Catholic college in the face of religious persecution. 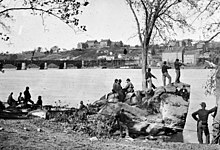 The university expanded after the American Civil War under the leadership of Patrick Francis Healy, who came to be known as Georgetown's "second founder" despite having been born into slavery. Jesuits have participated in the university's administration since 1805, a heritage Georgetown celebrates, but the university has always been governed independently of the Society of Jesus and of church authorities. Comprising nine undergraduate and graduate schools, the university enrolls approximately 7,000 undergraduate and 10,000 post-graduate students from a wide variety of religious, ethnic, and geographic backgrounds, including 130 foreign countries. The university's most notable alumni are prominent in public life in the United States and abroad. Among them are former U.S. President Bill Clinton, U.S. Chief Justice Edward Douglass White, U.S. Supreme Court Associate Justice Antonin Scalia, dozens of U.S. governors and members of Congress, heads of state or government of more than a dozen countries, royalty and diplomats. 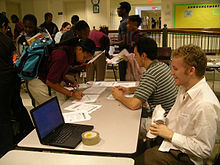 Campus organizations include the country's largest student-run business and largest student-run financial institution. Georgetown's athletic teams, nicknamed the Hoyas, include a men's basketball team that has won a record-tying seven Big East championships, appeared in five Final Fours, and won a national championship in 1984, as well as a co-ed sailing team that holds nine national championship and one world championship title. Because of Benjamin Franklin's recommendation, Pope Pius VI appointed former Jesuit John Carroll as the first head of the Roman Catholic Church in America, even though the papal suppression of the Jesuit order was still in effect. Carroll began meetings of local clergy in 1783 near Annapolis, Maryland, where they orchestrated the development of a new university. On January 23, 1789, Carroll finalized the purchase of the property in Georgetown on which Dahlgren Quadrangle was later built. Future Congressman William Gaston was enrolled as the school's first student on November 22, 1791, and instruction began on January 2, 1792. What are the academic rankings for Georgetown University? 1. number 42 for Academics. 2. number 88 for ROI (Return on Investment). What universities are similar to Georgetown University?